High summer in Scotland! 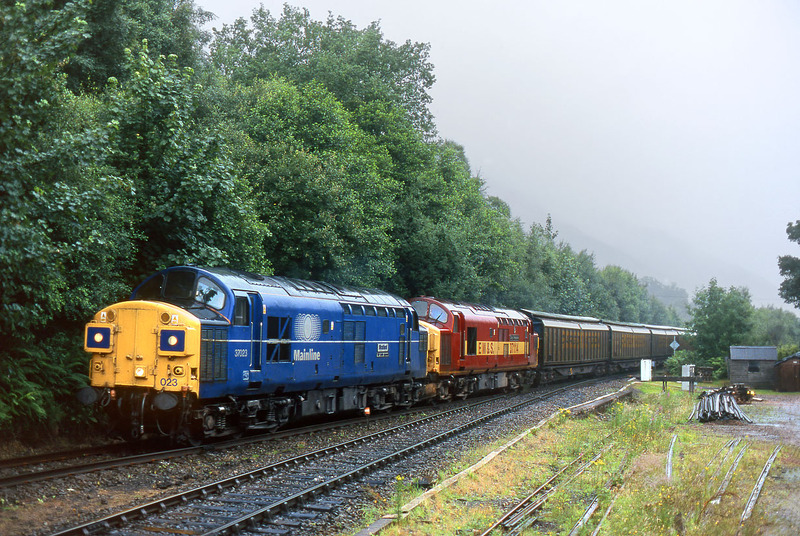 37023 Stratford TMD Quality Approved & 37114 City of Worcester arrive at Ardlui in the rain on 23 July 1999 with the 7D60 15:00 Forth William to Mossend Enterprise. This pair of locos was booked to work the following day's Mercia Railtours 'Tiberius Kirk' railtour, but 37023 disgraced itself at Tulloch, leaving 37114 to carry on alone. Such was my bad luck with the weather in Scotland at the time, that when I arrived at my usual B&B, the owner accused me of bringing the bad weather with me, as apparently it was 'fine yesterday'!